Notes: Based on the Dragon Ball manga by Akira Toriyama, which ran from 1984-1995 in Weekly Shonen Jump. It is available in North America, licensed by Viz. We are reviewing not only the TV series available in the United States, but the series as a whole. The reason it earns the "mythological" label is because it was originally based on the legendary story "Journey to the West", albeit VERY loosely. To celebrate the 20th anniversary of Dragon Ball Z, Toei re-edited the series and showed it in high definition under the name Dragon Ball Z Kai, which reduces the episode count of the series, as well as fix animation errors. Do note this review was written a couple of years before the much, much better received Dragon Ball Z Budokai games came out on the PlayStation 2, and the games following. The original Dragon Ball TV series was about the adventures of a young, powerful boy, and his friends as they searched for the elusive seven Dragon Balls, which could grant any wish. 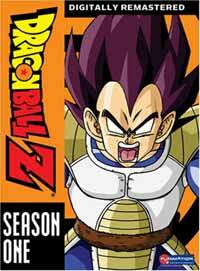 Dragon Ball Z continues the story of his adult years, and of the adventures of his two sons Gohan and Goten. Needless to say, Dragon Ball Z is NOT the cute, lighthearted romp the original was; for in Z it is revealed Gokuu is a member of a super powerful and ultra violent alien race known as the Saiyajin. For a series called "Dragon Ball Z", there isn't a lot of reference to the actual balls themselves. They seem only to exist to bring back the main characters when they die. And die they do...often, and usually violently. DBZ fans will hate me for this, but... this is NOT the "Mother of All Anime". In fact, it's repetitive, low-quality animation, with a middle-of-the-road storyline and wasted characters, and it's ultimately pointless. Why it's popular is beyond me. Wait, I take some of that back. The show actually does have good characterization. You do care about them, and want to get to know more about them. Sadly, the fights are so long and drawn-out that character development is completely lost. For example, there was so much comic potential in the relationship between Vegeta and Bulma...namely, that she was such a shrew, she was able to not only tame, but beat into submission the most powerful and possibly evil being in the universe, and even bear his child. That could've been a foil for so much of the repetitive blood, guts, and whatnot, but in the end, it's all but forgotten. Don't get me wrong, I won't deny Dragon Ball Z its place in anime history. Not only did this series solidify Toriyama Akira's status as a national treasure of Japan, but launched a worldwide marketing blitz rivaled only by Sailor Moon, and recently, Pokemon. But that still doesn't excuse the fact that it's at best, a mediocre show. You can only go so many episodes watching buildup to a fight that lasts all of three seconds. But it IS a glorious three seconds.... I think... Really, you'd want to believe this would make a perfect video game, if anything...but oh the irony. Every single fighting AND role-playing game based off this series has been a complete lemon.